Wii Fit is the newest gadget created by Nintendo. It is basically a game, but it incorporates healthy exercises. You can practice yoga, strenght training, balance and aerobics. You can also find out your body's performance by using the Body Test application provided by Wii Fit. The gaming console offers interactive games which require the player to physically move, a different approach of gaming if we consider the other types of games, which offer sedentary activities, in front of the computer or TV. Health specialists say that this is an excellent idea of making people do physical exercices and mantain their physical condition. If fact, being as fit as a fiddle doesn't require so much effort nowadays because, as we can see, if we just play, we won't need any other type of work. 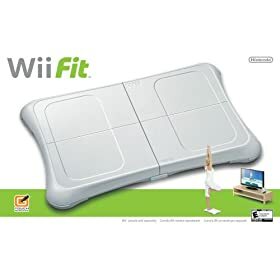 Nintendo Wii Fit is avalaible HERE at the price of only $90.